Quincy Jones: “It’s still fucked up. 1964, when I was in Vegas, there were places I wasn’t supposed to go because I was black, but Frank [Sinatra] fixed that for me. It takes individual efforts like that to change things. Meanwhile, On Mountjoy Square, Dublin Defending Bono We Get To Carry Each Other Anything Good On CNN? 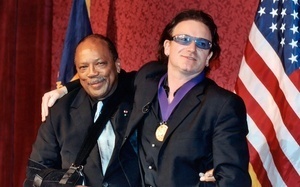 Posted in Misc and tagged Bono, Quincy Jones at 4:14 pm on February 7, 2018 by Bodger. Bono also has a son called Quincy? Elijah Bob Patricius Guggi Q Hewson. I’m sorry I bothered to google that. No wonder people shout at Bono. Quincy is known as Q, innit. lol… Take a bow and keep on keeping on…. I present to you an internet. Someone find out if Quincy is on Twitter and whether he’s pro-life. Then we can decide how to treat this particular American. Anti-choice and pro letting women die in agony of sepsis because some people can’t deal with the facts of life, you mean..? Ah here…. what has this thread got to do with that? You are starting to sound irrational. I don’t agree with your viewpoint on abortion but you tend to manage to articulate it in a reasonably rational manner. I thought maybe you had done it by mistake until I saw you actually referenced Quincy Jones. Again, ah here…. Fair enough. Sorry for dragging Quincy into this. Thought it was on topic given…you know. Well it was tongue in check, obviously. Your comments are starting to get a little pathetic or desperate or both. Before Quincy came over, did his da post about how proud he was that Q would be working for the Lie Institute? Rashida did “Who Do You Think You Are” and came to the Jewish Museum in Dublin to find out about her mother’s family who lived here for a while after they fled pogroms in Lithuania or Latvia or some L country. She comes across as very normal compared with Quincy who seems utterly batpoop. Maybe it’s coz everyone was calling Bono a pox and Q thought it was meant for him. What does it mean “He shook his head”. Was that good or bad, we can’t actually see. I would say when you shake your head you mean no and to nod your head to indicate agreement. In this Quincy shook his head so he was probably disagreeing. unless you are Indian or Bulgarian. 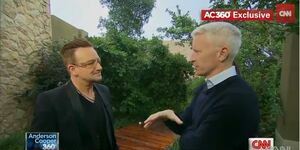 Bono doing great work for the country telling people we are racist. Thanks Bono.